We are obviously a big fan of sister teams... And this sister team is unstoppable. We are a bit jealous of their fun careers on Broadway in NYC and as the Sr. Manager of Art Direction at Evite in LA. This Darling of the Month (or should we say, Darlings) have your back covered on the party front! Looking for creative birthday party ideas, halloween outfits or even gifts that give back? Then you've come to the right space. 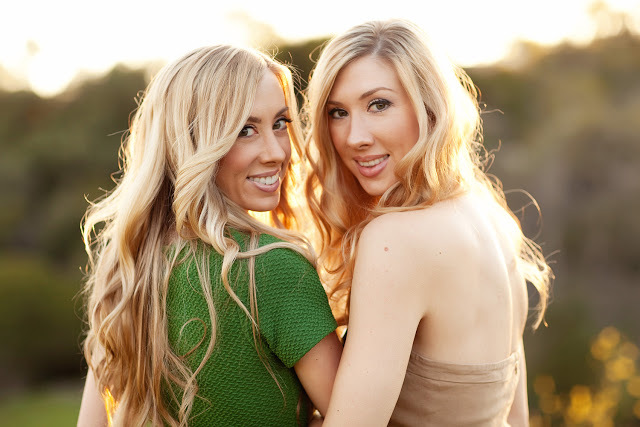 Meet Jessica and Jen from Linen, Lace and Love... they are your creative queens. A: 15 seconds? hmmm ok! We wanted Linen, Lace, & Love to be a collage of all the things that make up who we are: amateur photographers, build-it-yourself, do-it-yourself, not afraid to get covered in spray paint and glitter, and then turn around and get all dolled up to go out with the girls. Paint covered jeans Saturday afternoon, and something fabulous that night. We're somewhere caught in the middle, and so is our blog. Trying to be fashion conscious, earth conscious, body conscious, and creative all at the same time. Choosing above all else, to find the joy in all things beautiful. Q: Where did the idea for Linen, Lace & Love come from? A: We both got married in the same summer (sorry Dad) and made EVERYTHING for both of our weddings. We all but moved into our parents house in San Diego and turned it into a crafting wonderland. Once the weddings were over, we were surprised by the amount of feedback we received from future brides who wanted to know how we designed, styled, and built our weddings. We decided to answer those questions by starting a blog. Since then it has grown from weddings, to DIY, parties for all occasions, tips, beauty, "styled love" which is style featuring a giveback brand. Q: Your company specializes in DIY & Party Ideas! How do you find ways to stay creative in an industry that is always on top on executing the coolest ideas? A: It's in our blood! We always joke that throwing parties is our family's "love language." We grew up in a family that loves to entertain and be surrounded by the people who make us laugh the most. Also, we make it a habit to celebrate everyones awesome ideas. There are so many amazing and talented people in this industry, we're just trying to share what speaks to us, and we hope to make some friends along the way. A: The invitation. It sets the tone for the entire party before you even get there! It should tell you the who-what-where-when info, but if it's done right, it also tells you the color palettestyle, even the appropriate attire can be implied by the invite. Q: Best advice you've received about being in business, especially with a family member. A: Blood is thicker than glitter. Creating your own business is a lot of hard work, and doing it with someone you love can be amazing and challenging all at the same time. When ever we get over worked and frustrated (which happens when we both have other full time demanding jobs) we always have to step back and remind ourselves that what we are doing should be fun, and that no matter what, our love for each other comes first. A: Collaborations are key. We've met some really phenomenal people in this industry, and made some amazing friendships! What is something you wish you knew before you started your own business? A: Nothing! If we had any idea how much work it would be we never would have done it. Passion and naivety are two incredibly powerful forces in starting something new. A: Both! Chocolate! Musical Theatre...fun fact! Jen is working on her first Broadway show right NOW!! She is a stage manager for The Deaf West Revival of Spring Awakening! We are San Diego girls, so we have to vote for the beach. What started out as an exciting wedding project has turned into a lifestyle that every woman can take something away from. We definitely are inspired by their relationship with one another while pursuing a multiple of fields that they find joy in. Now it's your turn to craft up a storm, Darlings.